Eleuthero is a woody, shrub-like plant in the ivy family that is native to Asia. Although this herb is better known as Siberian ginseng, use of the word “ginseng” in the U.S. is now limited to the Panax genus so the term is no longer accurate (or legal for marketing purposes). The root of the plant has been used for centuries in Asia to produce restorative teas and tonics. In addition to flavonoids, vitamins and minerals, eleuthero root contains a variety of polysaccharides and specific compounds called eleutherosides. Eleuthero is native to Siberia, northern China, Japan and Korea, now naturalized in northwestern U.S. and British Columbia. Eleutherococcus senticosus is a small, woody shrub in the Araliaceae family. It grows 3 - 10 feet high. Its leaves are attached to a main stem by long branches. Both the branches and the stem are covered with thorns. Flowers, yellow or violet, grow in umbrella-shaped clusters, and turn into round, black berries in late summer. The root itself is woody and is brownish, wrinkled, and twisted. Common names like Devil’s Shrub and Devil’s Bush are in reference to the spiny branches. 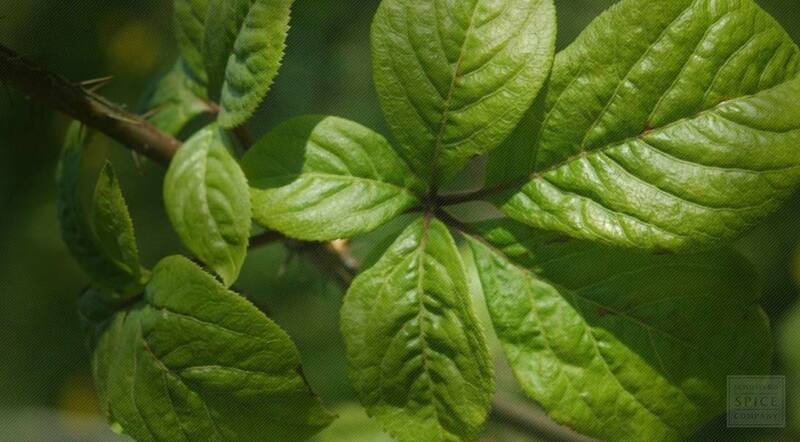 Eleuthero grows in mixed and coniferous mountain forests, forming low undergrowth or is found in groups in thickets and edges. It is sometimes found in oak groves at the foot of cliffs, very rarely in high forest riparian woodland. It can tolerate sun or dappled shade. Eleuthero is adaptable to many soils, growing in sandy, loamy, and heavy clay soils with acid, neutral, or alkaline chemistry and including poor soils. Sow seeds as soon as they are ripe in the autumn in a cold frame. Seeds can be slow to germinate. Stored seed requires 6 months warm followed by 3 months cold. Transplant the seedlings into individual pots when they are large enough to handle and grow them on in light shade in a cold frame or greenhouse for at least the first winter. Plant out in late spring or early summer. This plant may also be propagated by cuttings or division. The roots are harvested in the autumn, cut and dried for later use. Dried root may also be ground in powder.